Since 1959, 42 epizootics of high pathogenicity avian influenza (HPAI) have occurred (Figure 1). Thirty-five of these epizootic HPAI viruses were geographically-limited (mostly to single countries), involved farm-to-farm spread and were eradicated from poultry by stamping-out programs; i.e. the HPAI viruses did not circulate in wild migratory birds. However, five outbreaks having also used vaccination as a management tool in addition to stamping-out strategies. An H5N1 HPAI virus emerged in 1996 in a goose in Guangdong China (Gs/GD lineage), and unlike the viruses in the other 39 HPAI outbreaks, has caused deaths in wild birds, poultry and humans, and spread to over 70 countries in Asia, Europe, Africa and North America; drastically changing the perspective on HPAI biology. Avian influenza (AI) viruses are a diverse group divided into 144 different subtypes based on different combinations of the 16 hemagglutinin and 9 neuraminidase subtypes, and also classified into two different pathotypes (low [LP] and high pathogenicity [HP]). The first cases of HPAI, previously termed fowl plague, were reported in 1878 in northern Italy, followed by widely dispersed geographic outbreaks throughout the late 1800’s to 1950’s in Europe, Asia, Africa, and North and South America. In general since 1959, HPAI outbreaks have been more geographically restricted with 42 distinct HPAI epizootics. Such HPAI viruses have arisen from H5 or H7 low pathogenicity avian influenza (LPAI), which the latter are non-pathogenic flora (i.e. LPAI viruses) in some migratory waterfowl and shorebirds. These LPAI viruses after exposure, adaptation and circulation in gallinaceous poultry developed specific mutations in the hemagglutinin protein that conferred phenotypic traits of HPAI viruses. The majority of the recent outbreaks of H5N1 HPAI (A/goose/Guangdong/1/1996, Gs/GD lineage) have occurred in Egypt, Indonesia, Vietnam, and Bangladesh, in decreasing order, were the virus is endemic in poultry populations. Since 2014, large outbreaks have occurred in poultry in USA, Taiwan, South Korea, and African, Middle Eastern and European Union countries. The majority of the Gs/GD HPAI cases were H5N1 but assortment of the virus has produced H5N2, H5N3, H5N6 and H5N8 HPAI viruses of the 2.3.4.4 clade that have spread across broad geographic areas. The 2014-15 H5Nx Gs/GD HPAI outbreak in the USA was eradicated by stamping-out program that covered 6 months, affecting 50 million poultry and cost the federal government $850 million. The severity, size and broad geographic distribution of H5Nx Gs/GD epizootic merits the term panzootic. Other sporadic outbreaks of H5 and H7 HPAI have been reported around the world, most recently in France, United Kingdom, Germany, Italy and Mexico, and represent local mutation of LPAI to HPAI viruses. Most HPAI epizootics have been eradicated using traditional stamping-out programs, but beginning in 1995, five epizootics have added vaccination as an additional, interim control tool. From 2002-2010, >113 billion doses of AI vaccine were used in poultry in 15 countries. The majority of vaccine (99%) has been used in the four H5N1 HPAI enzootic countries (China [91%], Egypt [4.7%], Indonesia [2.3%], and Vietnam [1.4%]) where vaccination programs are directed to all poultry. Implementation of vaccination in these four countries occurred after H5N1 HPAI became endemic in domestic poultry and vaccination did not result in the endemic infections. The other 11 countries used less than 1% of the vaccine, administered in a focused, risk-based approach. Inactivated AI vaccines accounted for 95.5% and live recombinant virus vaccines for 4.5% of vaccine used. Clinical disease and mortality were prevented in chickens, and rural livelihoods and food security were maintained by using vaccines during HPAI outbreaks. Fewer outbreaks of H5/H7 LPAI have been reported than HPAI and only six countries used vaccine in control programs which accounted for 8.1% of the total H5/H7 AI vaccine usage. Stamping-out without vaccination has been the preferred method for HPAI control and eradication used successfully in 36 HPAI epizootics. Figure 1. 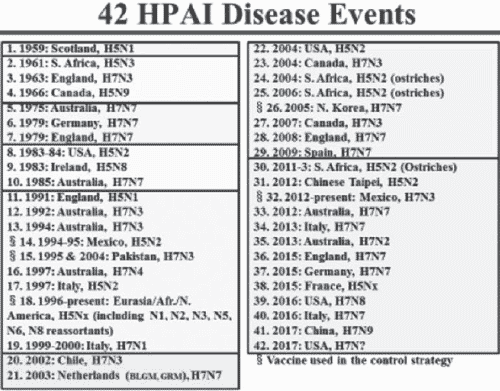 42 Highly pathogenic avian influenza disease events (epizootics) since 1959.